“The Other Shape of Things” is the title of two ongoing sculptural projects produced through heterogeneous technologies and techniques, including 3D-scanners, data manipulation and 3D-printing. The first project, The Other Shape of Things – 1. 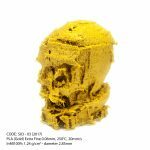 Failed Objects (2017-ongoing), focuses on a collection of hundreds of ‘failed objects’: 3D prints that I collected before they were destroyed by 3D printing labs all over the world. This project tackles the concept of ‘failure’ within technological mediations and technical reproductions. The second project, The Other Shape of Things – 2. Datamorphosis (2019-ongoing), consists of 15 series of sculptures, called Libri (Books), based on the 15 books that comprise Ovid’s poem The Metamorphoses. It explores the possibility of interpreting Latin poems about metamorphosis as coding instructions and spatial coordinates for the production of new sculptural forms. Low Form. Imaginaries and Visions in the Age of Artificial Intelligence. Rinkel, Bram. The influence of digital and robotic techniques on sculpture. (Tentative title, MA Thesis, advisor: Ria de Boodt). Developed with the support of a Critical Media Practice Mellon Grant from the Film Study Center at Harvard University and additional support from GALLLERIAPIÙ. 3D-scanning support was offered by Rachel Stefania Vroman, Noam Saragosti, Christopher Hansen, James David Moffet III, Sejung Song, and Anthony Natale at the Harvard GSD Fabrication Lab. Special thanks to the following individuals and 3D-Printing Labs: 3D Transformations, 3DME, Alex Myers, Amor Danato, Andrew DeGonge, Andy Perkins, Armature Nine, Ben’s Hub, Blown454, Brian Minie, Brian’s Hub, Burak Bingollu (Mappleseed), Chris Digiacomo (Digi-Akimo), Corey Dollar, Dennis Harroun (Mana Digital), Devin Brown, Edison DDDesign, Emmanuel Giloz, Empirical Innovation, Fred Kahl Freidini, FROST, Jacob Blumberg, Jeremie François, JMO Technology, Joe Rizo, Joe Szilvagyi, Jon Cobnut, Josh Bernstein’s Hub, Juan Navarro, LePhilip, Makei, MakeLab NYC, Matt’s Hub, Matteo Forgione (Forgione Engineering, Inc.), Michael Weibel, MONO’s Hub, Newton Library (Masachussets), Openly, Paul Pape Designs, Peter Tolmie, PLV Concept’s Hub, PLV Hub, Ryan Clark, Sam Froud, Scott Janousek, Shannon Klappstein, Solution Nexus Hub, Stephen Somers, Todd Schlemers, Uni-t, Viriya, Voodoo Manufacturing, Voxel8, Z3D and Zack Dowell. Exhibition shots by Stefano Maniero.